Analysis of vibrations and displacements is a hot topic in structural engineering. Although there is a wide variety of methods for vibration analysis, direct measurement of displacements in the mid and high frequency range is not well solved and accurate devices tend to be very expensive. Low-cost systems can be achieved by applying adequate image processing algorithms. In this paper, we propose the use of a commercial pocket digital camera, which is able to register more than 420 frames per second (fps) at low resolution, for accurate measuring of small vibrations and displacements. The method is based on tracking elliptical targets with sub-pixel accuracy. Our proposal is demonstrated at a 10 m distance with a spatial resolution of 0.15 mm. A practical application over a simple structure is given, and the main parameters of an attenuated movement of a steel column after an impulsive impact are determined with a spatial accuracy of 4 µm. C. Gentile and A. Saisi, “Ambient vibration testing of historic masonry towers for structural identification and damage assessment,” Constr. Build. Mater. 21, 1311–1321 (2007). A. K. Chopra, “Equations of Motion, Problem Statement and Solution Methods,” eds.,B. Stenquist and K. Scherwatzky, in Dynamic of Structures: Theory and Applications to Earthquake Engineering, 2nd Ed. (Prentice-Hall, 2001), pp. 23–25. S. C. Stiros, “Errors in velocities and displacements deduced from accelerographs: An approach based on the theory of error propagation,” Soil Dyn. Earthq. Eng. 28, 415–420 (2008). A. Cunha, E. Caetano, and R. Delgado, “Dynamic tests on a large cable-stayed bridge,” J. Bridge Eng. ASCE 6, 54–62 (2001). H. N. Nassif, M. Gindy, and J. Davis, “Comparison of laser Doppler vibrometer with contact sensors for monitoring bridge deflection and vibration,” NDT & E Int. 38, 213–128 (2005). M. Pieraccini, M. Fratini, F. Parrini, C. Atzeni, and G. Bartoli, “Interferometric radar vs. accelerometer for dynamic monitoring of large structures: An experimental comparison,” NDT & E Int. 41, 258–264 (2008). C. Gentile and G. Bernardini, “Output-only modal identification of a reinforced concrete bridge from radar-based measurements,” Nondestr. Test. Eval. 41, 544–553.(2008). J. J. Lee and M. Shinozuka, “A vision-based system for remote sensing of bridge displacement,” NDT & E International 39, 425–431 (2006). B. Ferrer, J. Espinosa, J. Perez, S. Iborra, and D. Mas, “Optical scanning for structural vibration measurement,” Res. Nondestruct. Eval. 22, 61–75 (2011). 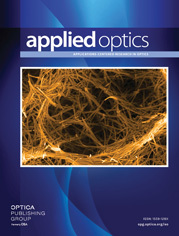 Edmund Optics Catalog, http://www.edmundoptics.com . M. R. Shortis, T. A. Clarke, and T. Short, “Comparison of some techniques for the sub-pixel location of discrete target image,” Proc. SPIE 2350, 239–250 (1994). M. R. Shortis, T. A. Clarke, and S. Robson, “Practical testing of the precision and accuracy of target image centring algorithms,” Proc. SPIE 2598, 65–76 (1995). A. M. Brucksteinand and A. O’Gorman, “Design of shapes for precise Image registration,” IEEE Trans. Inf. Theory 44, 3156–3162 (1998). J. C. Trinder, J. Jansa, and Y. Huang, “An assessment of the precision and accuracy of methods of digital target localization,” ISPRS Journal of Photogrammetry and Remote Sensing 50, 12–20 (1995). I. Maalen-Johansen, “On the precision of sub-pixel measurements in videometry,” Proc. SPIE 2252, 169–178 (1993). R. Kuritaand and E. R. Weeks, “Experimental study of random close-packed colloidal particles,” Phys. Rev. E 82, 011403 (2010). W. Tong, “Sub-pixel image registration with reduced bias,” Opt. Lett. 36, 763–765 (2011). LS-DYNA Keyword User’s Manual (v.970), Livermore Software Technology Corporation, April2003. Fig. 1. Detection of a target (black line) is done by a set of pixels, here marked with a grid. A displacement of 1/2 pixel to the left (gray line) is detected by a change in some of the detection pixels, now painted in gray. Although the structure has not moved a whole pixel, the geometrical bindings imposed on the target allow tracing the new contour and obtaining the new position. Fig. 2. Accuracy of the sub-pixel method for different dispersion errors. The rough appearance of the graph is due to the discrete nature of the calculations. Fig. 3. Video sequence for object tracking. Both sequences have been taken from 10 m distance. Target diameter is 5 cm. (a) Sequence from AOS camera, 250 fps, 100 px×100 px and no compression 8 bits AVI format (Media 1). (b) Sequence from CASIO camera, 420 fps, 35 px×35 px and AVI-jpeg RGB format (Media 2). This last sequence has been magnified and equalized in order to improve the visualization. Fig. 4. Target position obtained from sequence in Fig. 2(a) AOS and Fig. 2(b) Casio. Fig. 5. (a) Measured structure. (b) Position of the camera and pendulum. (c) Scheme of the experiment and model use for the Finite Element simulation. Fig. 6. Coordinates of the tracked center of the target. Fig. 7. (a) Fourier transform of the vibration of the column obtained from the horizontal position of the target (see Fig. 5). (b) Data fitting to Eq. (5).